2017 In Retrospect: It's been one helluva ride! Taking a look back on an incredible year. Most of you have participated, written about or supported the Girls Rock women’s mountain bike group in one way or another. THANK YOU! This group started 2.5 years ago with four women and has now blossomed to an incredible group of HUNDREDS of women in the Santa Cruz and surrounding Bay Area. Here, we’d like to review our 2016 events, preview events to come and thank everyone who has helped make our events so amazing! And we would love to keep the momentum going. So if you are interested in participating again in 2017, please contact us! Thank you for an amazing year. Thanks to the incredible support of the local bike shops, industry brands and fantastic volunteers, Girls Rock has been able to inspire scores of women to participate and gain skills in mountain biking by providing rides and resources that are supportive, social, fun and confidence-building. We have watched beginners turn in to racers, roadies fall in love with the dirt, friendships form, skills and confidence gained. We are incredibly proud of all that we have accomplished to date with the support of the local community. July - 67 RSVPed for Trailhead’s inspiring presentation at Demo. Thanks to Lars, Liia and Kellin at Trailhead! And of course, our continued monthly rides! We have a full line up hosts for 2017 and are looking for more to line up for 2018. If you would like to host a ride, donate raffle prizes or participate in some way, please contact us! December 9 - Holiday Partay!! We’d like to keep the momentum going, so we are ready to find hosts and supporters for 2018! Thank you to all our amazing volunteers who keep showing up! Thank you to all of the riders who keep coming! 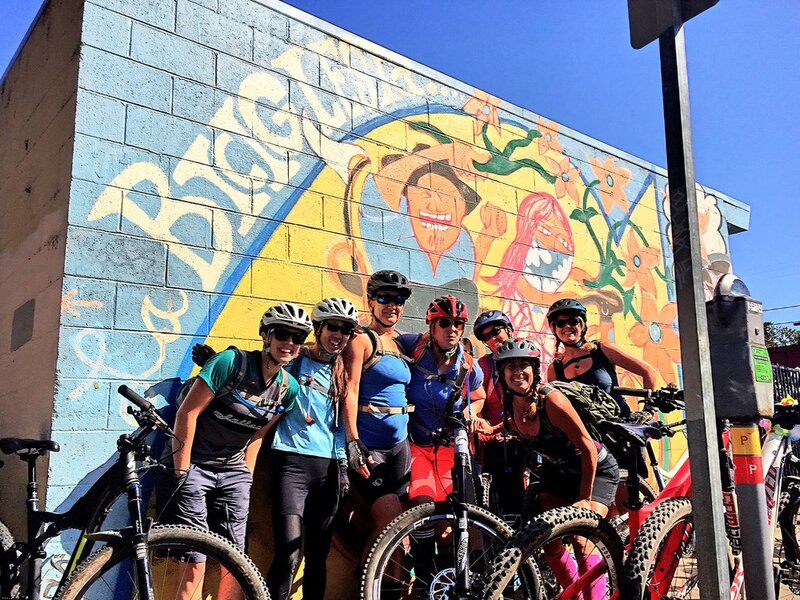 We love you all for being a part of this growing women's mountain biking community! 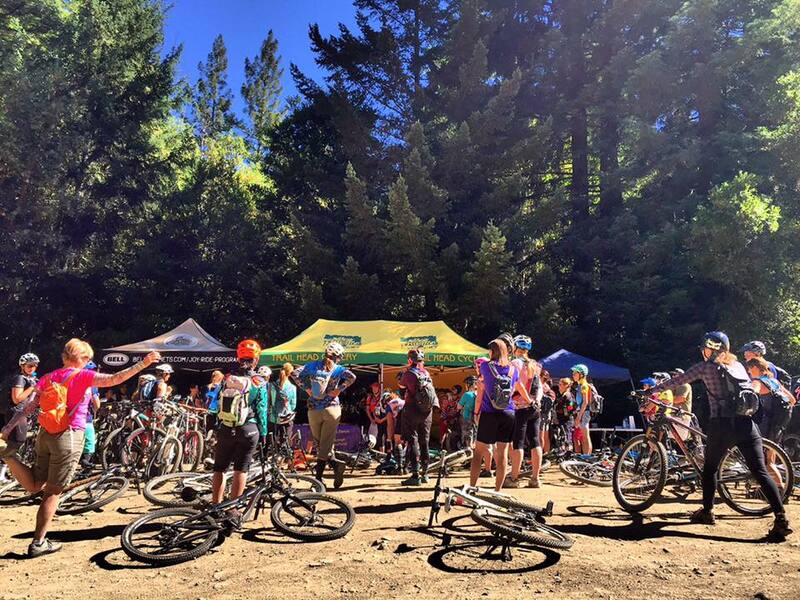 We look forward to growing women’s mountain biking through Girls Rock! Thank you for an amazing year. Thanks to the incredible support of the local bike shops, industry brands and fantastic volunteers, we have had an exciting year with Girls Rock inspiring women to participate and gain skills in mountain biking by providing rides and resources that are supportive, social, fun and confidence building. We have watched beginners turn in to racers, roadies fall in love with the dirt, friendships form, skills and confidence be gained. We are incredibly proud of all that we have accomplished this year with the support of the local community. January 2015 – Hosted by Bicycle Trip with demo bikes from Intense, Giant and Liv. Free water bottles for every rider from Liv, raffle prizes from Bicycle Trip and Liv, and pre-ride breakfast from Whole Foods. 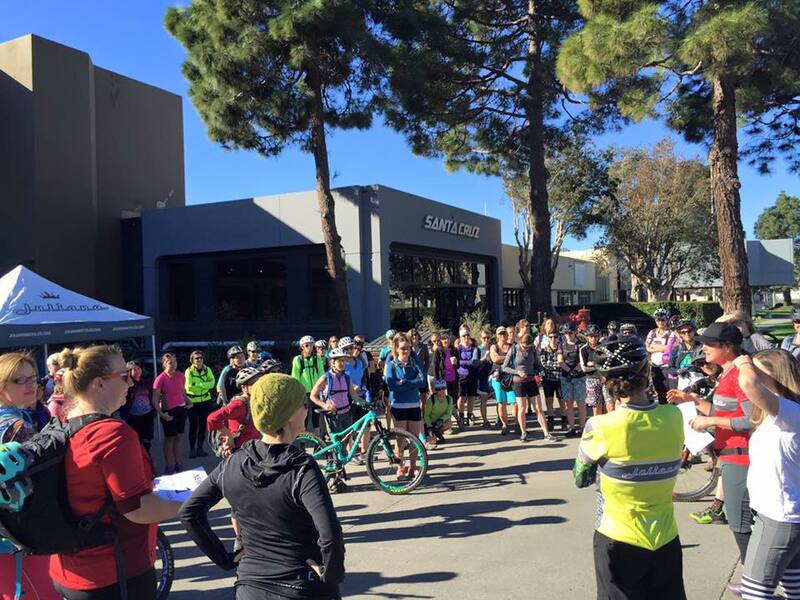 February 2015 – Hosted by Fox, Another Bike Shop (ABS) with Coach and Pro Rider Lorraine Blancher, pre-ride suspension clinic and set up with the Fox tech team, nutrition from Oxylent, coffee from Companion Bakeshop and raffle prizes from Fox, Raceface, Oxylent, Santa Cruz Coffee Roasting and ABS. 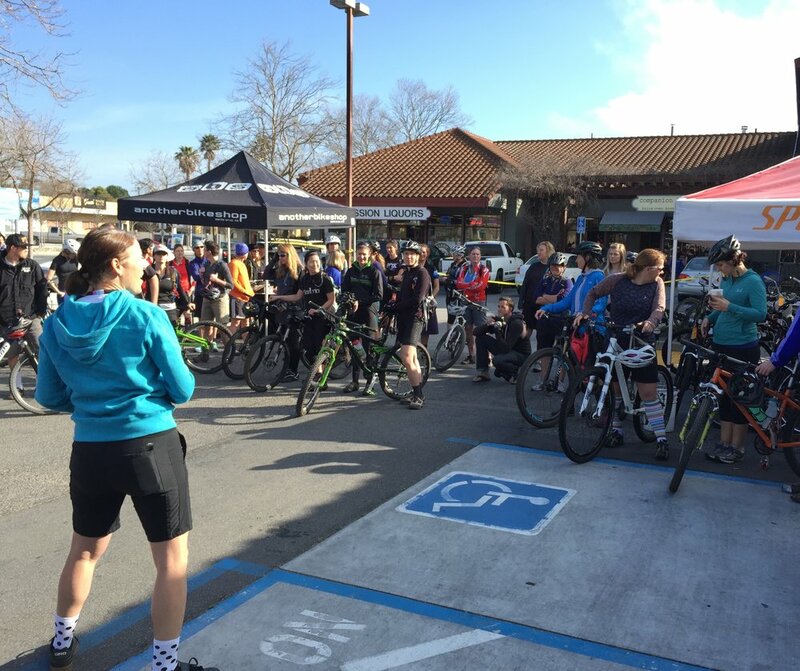 March 2015 – Hosted by Juliana Bicycles with bike demos, brand ambassadors (including Juli Furtado), and local bike shops Family Cycling and ABS supporting. Verve coffee and breakfast served pre-ride. Nutrition from Family Cycling and raffle prizes from Juliana, Bell and ABS. April 2015 – Hosted by Specialized AT Sea Otter with bike demos, ride with the pros and post ride beer at the Specialized booth. May 2015 – Hosted by Another Bike Shop with Bell Helmets where every woman got a Bell tank top and we raffled off a coaching session with former Australian DH Pro Scott Sharples. Raffle prizes from Icedot, ABS and Bell. June 2015 – Hosted by Epicenter Cycling with Trek demo bikes, shuttles to Demo with Adventuresmith and Cyclepath and a post-ride BBQ. Beginner skills clinic conducted by Velocity Bike Park. Raffle prizes from Epicenter Cycling and Bell. Pre-ride breakfast and post-ride BBQ supplied by Epicenter. July 2015 – Hosted by Vanderkitten at Ibis Cycles with Ibis Demos, nutrition from “It Works!” and a pre-ride Cyclocross clinic with two Vanderkitten pros. Raffle prizes from Vanderkitten and RaceFace. August 2015 – Hosted by Aptos Bike Station with Cyclepath, Cannondale, Gu, Blackburn. Nutrition clinic with Gu and free samples, beginner clinic with Coach Abby Hippely, shuttles to Demo and a post-ride lunch with baked potato bar. Raffle prizes from Cannondale, Blackburn, Aptos Bike Station. September 27, 2015 – Hosted by Sports Authority near Emma McCrary trail. $10 gift certificate for all attendees, raffle for $100 gift certificate and all day in store discount. October 17, 2015 – Hosted by Stockwell Cellars Winery with local, women owned brands Totally Tubular, Iconic Sport and artist Campbell Steers, and a post-ride wine tasting. Free samples from Pedal Power and Clif Bar. November 14, 2015 – Hosted by Mountain Bikers of Santa Cruz and White Lightening at Geo S Wilson parking lot. Education clinics from MBoSC and White Lightning on “Maintain Your Trail, Maintain Your Bike”. Raffle prizes from MBoSC including $500 Trek Gift Certificate, Fox fork, tee shirts and more. Free White Lightening samples to all attendees. Pre-ride breakfast and post-ride keg supplied by MBoSC. Gift certificates and nutrition from Clif Bar for every attendee. Juliann Klein of Klein Design (www.klein-design.com) and Alexis Morgan leading our digital efforts – including designing our logo, copywriting, launching and maintaining our web site, invitations and social media. Krista Gray for organizing our ride leaders and sweepers every month to ensure a successful, fun and safe ride. ALL of our ride leaders and sweepers who volunteer each month on our rides – there are just too many to name! To ALL of the businesses, shops, brands and people who have hosted and supported our rides to make this all possible. See a summary of our rides in 2015 below. We’d like to keep the momentum going, so we are ready to find hosts and supporters for next year! Thank you again for all the support! I look forward to growing women’s mountain biking through both Girls Rock and the Bell Joy Ride program!